Levenshulme Pride 2019 planning is underway but see our 2018 programme below to get a taste of what to expect. Get ready for a great weekend of entertainment! See below for listings of events and activities. Please check back as more is added. Full listings will be available online and on posters around Levenshulme over the weekend. Join us for our March at 14.00 on Saturday 18th August starting at Levenshulme Inspire and ending at Shine Hair. Our March is on the pavements with stewards to guide people and help at the crossings. This is our most high profile event bringing colour, joy and fun to Levenshulme. Everyone is welcome. Come and join us and help turn the A6 into the Gay6! The Vigil will take place as 16.00 on Sunday 19th August on the Village Green. This is an opportunity to stand in solidarity against hatred and oppression of LGBT people. 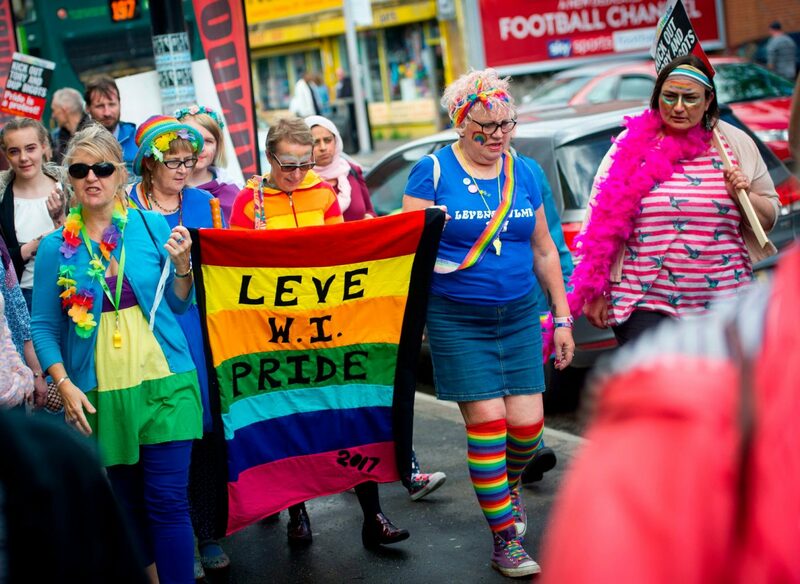 It is also a chance to say thank you to people involved in making Levenshulme Pride happen and celebrate and be proud of our very special community in Levenshulme. Listings are subject to further additions. 11.00 17.00 Babyobaidi Balloon Boutique Meet Princess Belle and Spiderman. Rainbow glitter, facepainting, 10% off everything instore. 19.00 Station Hop Hat Party – bring a hat, have a party! 20.45 Klondyke Cabaret with Gerry Potter, Jackie Hagan and The Vegan Queens hosted by Azure and Anthony Fletcher (the voice of Panda). 14.00 Klondyke “What does it mean to be normal?” Discussion led by Levenshulme Philosophy Café.